The 125 TPD hydrogen peroxide chemical complex is located in Dahej, Gujarat, India. Production process is based on unique, most advanced and patented Swedish technology. The plant is environment friendly with zero waste discharge. Hydrogen peroxide offered is available in 35%, 50% and 60% concentration. Indian Peroxide Limited (IPL), one of India's major manufacturers and suppliers of specialty chemicals, has launched its new hydrogen peroxide plant complex in Gujarat, India. The state-of-the-art manufacturing facility produces industrial grade, premium quality and environmental friendly hydrogen peroxide (H2O2). With best-in-class production process, IPL offers hydrogen peroxide in 35%, 50% and 60% concentration. Along with new plant complex, IPL plans to invest Rs. 750 Cr in next 3-5 years including capacity expansion for other chemical units leveraging synergy with the new H2O2 plant. Located in industrial hub of Dahej, Gujarat, the manufacturing facility with an annual production capacity of 45000 tons of hydrogen peroxide started its first commercial delivery on 10th October, 2018. The chemical complex sprawling across 150000 sqm is one of the biggest hydrogen peroxide manufacturing facilities in India. Production process is based on unique, most advanced and proprietary technology offered by Sweden based EB Nuberg. The plant aims to serve the increasing local demand primarily for premium quality and high concentration grades of hydrogen peroxide used in demanding applications within the paper & pulp, textile and waste water treatment industries among other applications across different industries. The plant adheres to world class standards for health, safety and environment (HSE). With a focus on environment, Indian Peroxide Limited uses the Zero Waste Discharge Process. This process allows recycling of water and chemicals leaving no wastage of liquid in the whole production process. The chemical produced will be supplied through 35 kg and 50 kg carboys and tanker transport system of 20-25 ton capacity. The new plant will help India in saving significant part of its hydrogen peroxide import bill. In 2017, India imported about 25% of its total hydrogen peroxide consumption. 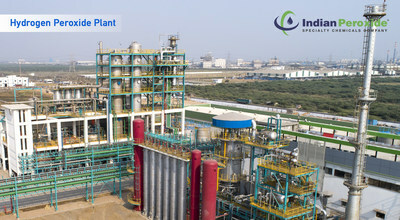 "IPL's new hydrogen peroxide complex is a flagship project for Indian market to support its growing demand for premium quality and environment friendly hydrogen peroxide. With best-in-class engineering and technology, we will set standards in terms of product quality, efficiency and environmental friendliness. The Swedish technology used in the production process ensures high quality H2O2 that will help end users to deliver better quality products to their customers," said AK Tyagi, Chairman and Managing Director, Indian Peroxide Limited. Hydrogen peroxide is an aqueous solution and a versatile chemical which is weakly acidic and is colorless. It is highly used as a bleaching and oxidizing agent in Paper & Pulp, Textile, Water Treatment, Pharmaceutical, Chemical and Electronics Industries. The usage of hydrogen peroxide includes oxidizing, bleaching, chemical synthesis, environmental control/ effluent treatment, sterilization etc. Indian Peroxide Ltd. (IPL) is a specialty chemical manufacturer. The company is one of the largest manufacturers of high grade, premium quality hydrogen peroxide in India. The world class manufacturing facility uses Swedish technology provided by EB Nuberg ensuring the highest quality standard production process to deliver premium quality hydrogen peroxide. IPL has a production capacity of 125 TPD and offers 35%, 50% and 60% chemical grade hydrogen peroxide to various industries. In future, company plans to add more specialty chemicals to its product portfolio.